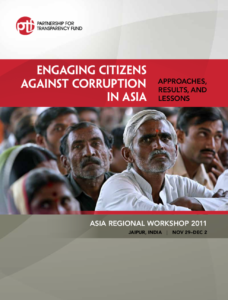 The report summarizes the combined wisdom of civil society organizations, citizens and anti-corruption experts, engaging in the fight against corruption in Asia. It details the workshop proceedings of the PTF-sponsored 2011 Asia Regional Workshop and provides practitioner-relevant expert advice, case studies and presentations that will help CSOs around the world create an even greater impact. CSOs identified “constructive engagement with authorities”, “innovative use of media” and “political economy analysis” as the most salient challenges to resolve, bringing their work to the next level.